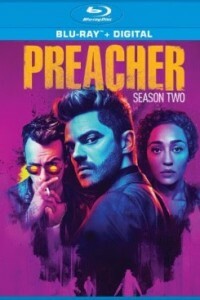 The extended second season is an absurdly twisted, action packed thrill-ride following Jesse Custer (Dominic Cooper, TV’s “Agent Carter,” Captain America: The First Avenger), a small-town preacher with a criminal past who sets out to find God upon learning He is absent from Heaven. Along for the ride are his ex-girlfriend Tulip (Academy Award® nominee Ruth Negga, Best Actress, Loving, 2016, TV’s “Agents of S.H.I.E.L.D.”) and his best mate Cassidy (Joseph Gilgun, This is England, TV’s “Emmerdale”), an Irish vampire. Finding themselves in New Orleans, the gang must dodge local gangsters, dangerous secret agents and the Saint of Killers (Graham McTavish, TV’s “Outlander”), an unstoppable murderous cowboy from Hell. UFOs! Bigfoot! Communists! The government has swiftly dealt with many a crisis. .